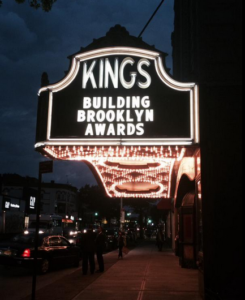 On July 21, 2015, Capalino+Company joined leaders in New York’s real estate and construction industry, local politicians and residents to celebrate the 15th Annual Building Brooklyn Awards which took place at the recently restored Kings Theatre in Flatbush. Hosted by the Brooklyn Chamber of Commerce, this exciting event recognized individuals as well as new and renovated construction projects that enrich Brooklyn’s neighborhoods and economy. The ceremony, which drew some of the biggest names in the industry and New York politics, honored thirteen local construction and renovation projects (full list below) in categories ranging from Adaptive Reuse, Community Development, Neighborhood Catalyst, Residential Low Rise, to the National Grid Award for Energy Efficiency. The awards were determined by a panel of judges comprised of leaders in city planning, business, architecture, and economic development. In addition, the Chamber recognized two special individuals – Purnima Kapur, Executive Director of NYC Department of City Planning, and our client Andrew Kimball, CEO of Industry City – who have been pioneers in enhancing the business conditions and economic climate of Brooklyn. Kapur received an award for her work with the City Planning Department and Kimball was recognized for his work with the Brooklyn Navy Yard and leading Industry City in Sunset Park. Capalino+Company congratulates both recipients for their incredible contributions to their communities and the borough as a whole. Many local elected officials were in attendance to show their support, including Lieutenant Governor Kathy Hochul and former Brooklyn Borough President Marty Markowitz who gave remarks. Others included Brooklyn Borough President Eric Adams, Assemblymembers Jo Anne Simon, Roxanne Persaud and Peter J. Abbate, Councilmember Mathieu Eugene, Brooklyn Chamber of Commerce President and CEO Carlo Scissura and Brooklyn Chamber Chair Denise Arbesu. Kings Theatre was not only the event venue, but also the awardee for Historic Preservation. Closed for over 40 years, the theater was recently restored and re-opened in January of 2015. Embellished with grandiose ceilings and awe-inspiring decor, the theater is now one of Brooklyn’s crown jewels and has reinvigorated the Flatbush area. It was the perfect backdrop to host the awards and demonstrate how the winning projects are truly catalyzing the borough. For more information, and to see the full list of projects, please visit The Brooklyn Chamber of Commerce website.